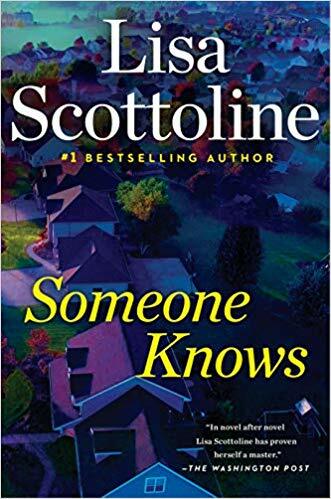 It literally pains me to write this negative review of Someone Knows by one of my top three authors, Lisa Scottoline. Teenagers Sasha, Julian, David, and Allie find a gun buried in the ground. Nothing good can come of that. When another teenager is shot dead playing Russian roulette, guilt changes all their lives forever. The author’s writing quality is spot-on as usual. However, the first half of the book is set twenty years before the present and reads like a young adult book. Sasha is an unrepentant Mean Girl—only her needs matter. Julian is in love with Sasha mostly from afar thanks to his “hobby” of peeping into windows. Allie is a conflicted chubby good girl broken by her sister’s recent death and mother’s emotional breakdown. David is being forced to be a star tennis player by his father regardless of his own desires. All are teenage stereotypes with little else distinguishing them. I forced myself to read the first half in the hopes of a great twisty conclusion. I was disappointed unfortunately. The denouement’s big surprise is completely unbelievable. In my opinion, Someone Knows was a failure from start to finish. Please read any other book by this author rather than this one. You will be glad you did. I’m giving this mess 2 stars because the writing, grammar and spelling are first rate. But the plot…the plot. Thanks to G.P. Putnam’s Sons and Edelweiss+ for a copy in exchange for my honest review.